Enter your email address and choose your notifications for MuscleSport - Rhino Black Series Pumped - Jungle Juice! 1000mg Nitrosigine® – The world’s most effective form of arginine works synergistically with citrulline to maintain improved blood flow up to 3 hours. Meaning easier, faster nutrient absorption into muscles...meaning fuller, stronger and better recovery!! 750mg Glycerol Monostearate – Blood Flow Enhancing & Fuller looking Muscle!! 600mg Alpha GPC – Enhances power outpu AND focus/mood enhancing. 100mg AmentoPump™ – Helps with vein dilation allowing blood to flow more freely, giving you monster pumps. 50mg Astragin® – Exclusive absorption enhancing ingredient proven to support ingredient bioavailability. These ingredients are just the best of the best. Working synergistically to deliver unseeen levels of pump. More focus and nootropic feels than y'all are ready for!! Whether your loaded up with those much needed 'carbs' or not, Rhino BLACK has got your back when it comes to making sure that feel good, mood-boosting, increased blood flow pumps are felt (and seen of course)!! MuscleSport have some crazy flavour names but you can think of this one as 'Grape with a twist'! Sweet grape with faintest hint of banana bubblegum (think Malabar!) and a bit of tropical flair! 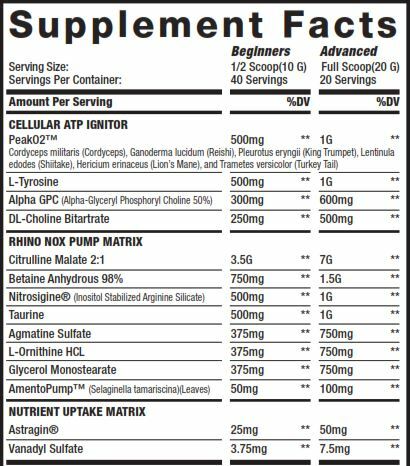 Ingredients: Taurine, Agmatine Sulfate,L-Ornithine HCL,Glycerol Monostearate, Glycerol (1,2,3-propanetriol), AmentoPump:AstraGin®, Vanadyl Sulfate, OTHER ingredients: Cluster Dextrin, Silicon Dioxide, Citric Acid, Natural & Artificial Flavours, Sucralose, Beet Root Powder (for colour).